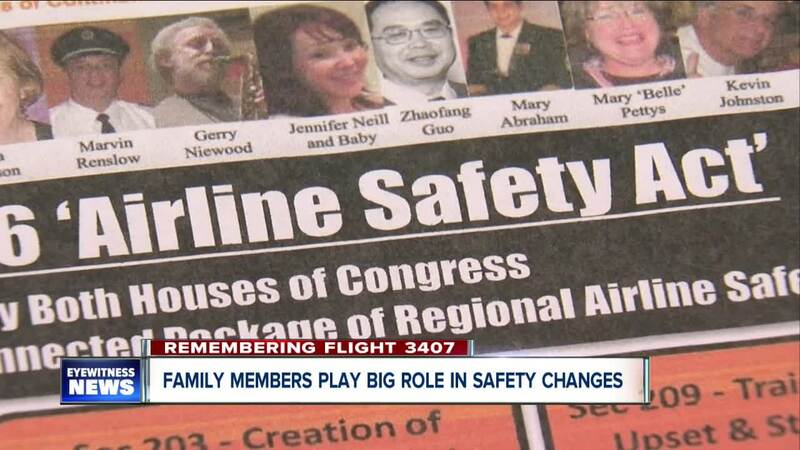 The Families of Flight 3407 have fought tirelessly for changes to aviation safety that affect us all. That includes the disclosure of what airline is flying your plane. BUFFALO, N.Y. (WKBW) — Every year, at least once a year for the last ten, a sea of red has flooded the halls of congress. A red tide rises up, calling for safer skies after the crash of Flight 3407. "We use the crash as a watershed moment of why we need change," Karen Eckert said. Eckert lost her sister, Beverly, in the crash. She was a 9/11 widow, who had met former President Obama, six days before she was killed. Karen met the president a little more than a year later. "When we had a photo taken with President Obama, we held up the photo of my sister, Beverly... and it's sad. Why are we meeting with the President of the United States -- because of a 9/11 tragedy, failure of security ... and for us it was a failure of safety," Eckert said. The crash of Flight 3407 is blamed on pilot error. Pilot Marvin Renslow did not properly handle an aerodynamic stall. He pulled back on the plane's yolk, rather than pushing down. Stall recovery training for pilots is one element of the Airline Safety Act of 2010, passed as a result of the Clarence Center crash. Victims' families pushed to have this included, along with other training mandates and the exposure of who is flying your airplane. "I had no idea. I don't think any of us had any idea," Justine Krasuski said. Krasuski had no idea her husband, Jerry, was flying a regional carrier, Colgan, a code-share for Continental Connection. After the crash, the families learned about the difference in pilot qualifications, for regional airlines like Colgan, and mainline airlines like Continental. "The low wages, the low experience levels of the pilots on the regionals, that wasn't occurring with the majors," Eckert said. They wanted and achieved one level of safety for all carriers, rather than different systems with different standards. "Let's raise the minimum pilot qualifications, more on par with the majors," Eckert said. "We knew the majors were hiring pilots at about 3,000 hours or 10,000 hours of experience. The regionals...we know of many pilots hired at 500 hours and they could have gone as low as 250 hours of experience, as the minimum." Mixed with inexperience, the Colgan pilots were tired. The second-in-command traveled cross country to make this flight. She was sick and needed rest. "The flight and duty times had not been changed in years and it really didn't give pilots sufficient time for rest between flights," Eckert said. That all changed after President Obama signed the safety act into law. It was recently reauthorized. The absence of airline crashes in the ten years since 3407 is something they're most proud of. But these family members are not fighting for their loved ones, but because of them, to keep us all safe. "Everyone who's landed safely in those ten years... they don't know... I mean, I don't think any of us realize, it could have been us," Eckert said. "I fly, my friends fly, we all fly. We didn't do it for Beverly or for Jerry. I mean they're gone... we did it so this doesn't happen again." Join 7 Eyewitness News in remembering the lives lost in the crash of Flight 3407. Read more about their families' fight for safer skies in the decade since, here.